Titian’s so-called “Madonna of the Rabbit,” currently hangs in the Louvre whose website notes the popular title but more accurately labels the painting as “The Virgin and Child with St. Catherine and a Shepherd, known as the Madonna of the Rabbit.” Actually, a better title would be “The Mystic Marriage of St. Catherine,” a common devotional subject during the Renaissance. Below I reproduce an interpretive essay that takes issue with the Louvre and others about two important details in the painting. Secondly, I disagree with the Louvre’s explanation that the white rabbit is a sign of Mary’s virginal fecundity. X-ray examination has shown that the rabbit was not originally present. 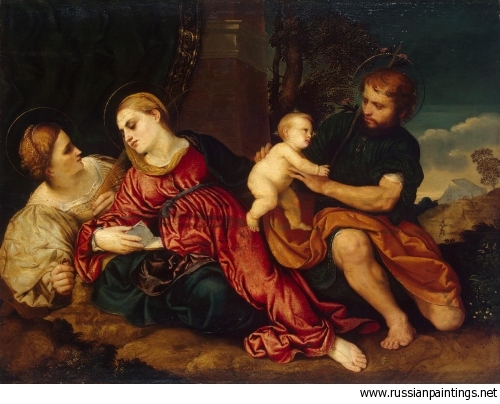 Initially, Titian placed Mary’s left arm on her lap. Why, on second thought, did he add the white rabbit? The following essay argues that the white rabbit is the equivalent of the Eucharistic host. 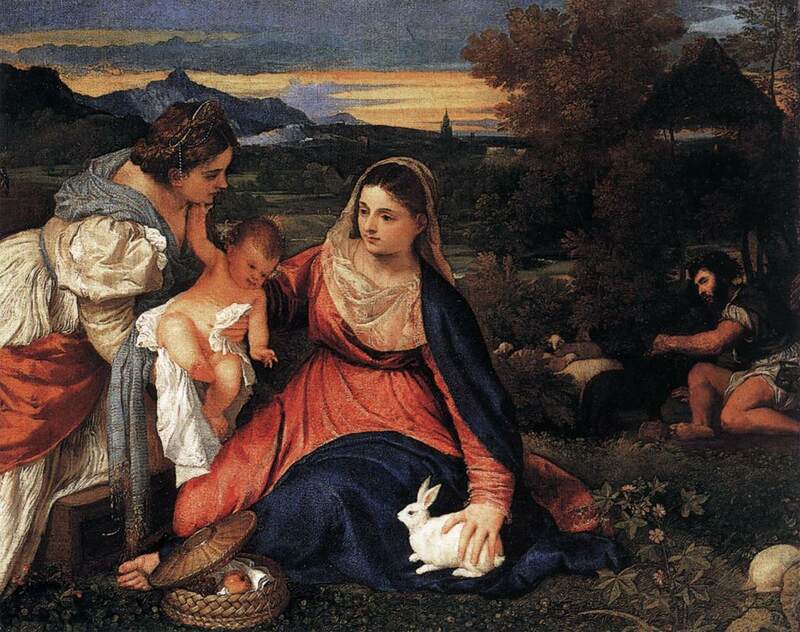 Titian’s “Virgin and Child with Saint Catherine and a Shepherd” is commonly called the “Madonna of the Rabbit” because of the white rabbit prominently featured in the center. The rabbit is held by the Madonna with a thin white cloth that is hardly visible today. The relatively small painting (71 x 87 cm.) that bears Titian’s own signature is in the Louvre and most scholars date it to 1530 although some believe it could have been laid in as early as 1520. The Louvre’s website provides a very comprehensive audio-visual examination of the painting featuring curator Jean Habert. 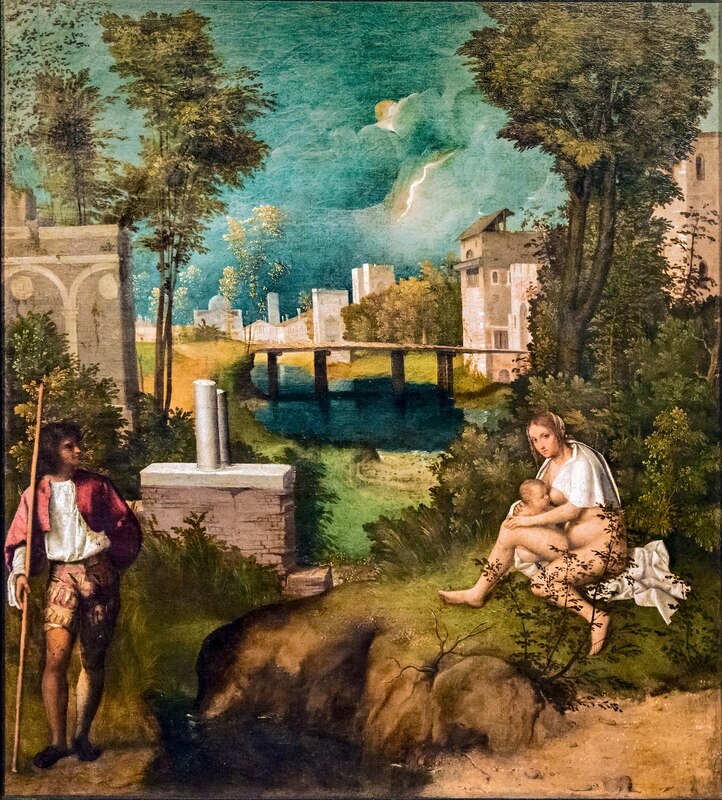 He begins with a discussion of Titian’s naturalism and suggests that these figures in a landscape could almost be a genre painting, something like a picnic in the countryside. Nevertheless, Habert admits that it is obviously a religious painting and a “sacra conversazione” in particular. The Madonna and Child are in conversation with St. Catherine while the shepherd off to the right represents pagan antiquity. This description echoes what can be found in a number of catalogues beginning with the 1991 “Titian, Prince of Painters” where the essay on the painting was also written by Habert. Subsequently, Filippo Pedrocco discussed the painting in his Titian catalog of 2001, and then two years later David Jaffe wrote the article in another exhibition catalog, entitled simply “Titian”. Despite this virtual unanimity the painting is still largely misunderstood. The title, Madonna of the Rabbit, is almost childish and the painting is not a “sacra conversazione.” The painting is a version of the “Mystical Marriage of St. Catherine,” a very popular subject in the early sixteenth century. It is very difficult for scholars today to understand the importance of St. Catherine in the Renaissance. It would even be difficult for a modern devout Catholic. Writing in the nineteenth century Anna Jameson noted that Saints Catherine, Barbara, Ursula, and Margaret were in a class by themselves. In “Sacred and Legendary Art” Mrs. Jameson devoted a long section to St. Catherine, her legend, and her representations in art. Although largely forgotten today, the legend must have been well known during the Renaissance especially given the fact that the famous monastery that bore her name on Mt. Sinai had become a favorite pilgrimage site. Let me just paraphrase Mrs. Jameson’s telling of the story with special attention to elements that might help to explain Titian’s painting. According to the legend Catherine was born late in the third century to the pagan King and Queen of Egypt. By the time she was fourteen the young princess had already won renown for her great beauty and intellect. At that point her father died and she acceded to the throne. Despite her breeding and wisdom, her noble subjects insisted that she find a husband who could assist her in governing the Kingdom. She agreed but only if they could find a man whose wisdom and wealth exceeded her own. Of course, no such man could be found. However, the Madonna, from her place in heaven, intervened and directed an Egyptian hermit to approach Catherine and tell her that Mary’s son is more than worthy of her hand. Then, Catherine has a dream and is taken up into the heavens where she enters into a room filled with beautiful saints and angels. They take her deeper into the sanctuary where she is introduced to Madonna herself, who then escorts her into the presence of her Son. But Jesus turns away and refuses to accept her. At this point, an anguished Catherine wakes from her dream. What had gone wrong? She seeks out the hermit who tells her she was rejected because she was a heathen. Immediately, Catherine takes instruction and is baptized a Christian. Now Catherine has another dream. Once again she is welcomed into Heaven and ushered into the presence of the Madonna who presents her to her son and vouches for her by saying that she herself has become godmother to Catherine at the baptism. This time the Lord accepts Catherine and places a ring on her finger, a ring that is still there when she wakes from the dream. It is only after this “mystical marriage” that Catherine would go on to suffer torture and death at the hands of a cruel Roman tyrant whose offers of marriage she spurns. Titian’s painting is not about historical accuracy. It is an account of Catherine’s dream. Painters typically portrayed the mystical marriage as taking place in the Egyptian desert three hundred years before the time of Catherine. The Holy Family is returning from their sojourn in Egypt when Catherine comes upon them. In Titian’s version of the Mystic marriage Catherine is easily identified by her regal, golden finery although she is somewhat disheveled. Her red robe has fallen around her thighs. She kneels on a wooden box that most commentators have identified as the broken wheel, the famous instrument of her later torture. She has taken the Christ Child in her arms and while he looks away at the rabbit, he strokes her chin with his hand. Madonna sits on the ground wearing her familiar red dress and blue robe. She has obviously handed the child off to Catherine but still looks intently at him. Scientific investigation of the underpainting has revealed that she was originally looking at the man off to the side. Her right arm is hidden but her left hand holds, with a hardly visible white cloth, a striking white rabbit. The man on the right dressed in rustic clothing is usually called a shepherd but he can only be St. Joseph. Who else would be with Mary and the Child in the Egyptian desert? In contemporary paintings of the same subject by Paris Bordone and Lorenzo Lotto he would figure even more prominently. Both Bordone and Lotto portrayed Joseph as quite young and virile and in one Bordone version, now in the Hermitage, Joseph’s garb is also rustic. Moreover, even when commentators have called him a shepherd, they note some regal features like the laurel wreath in his hair. Some think it might even be a portrait of Titian’s noble patron. The fact that the underpainting shows that the Madonna was originally looking at him also points to his elevated status. Joseph sits on the ground stroking another animal, either a black sheep or ram. There is much more than the fruit in the basket to indicate the Eucharist. The strawberry plant in front of St. Catherine is often associated with an earthly paradise, but can also symbolize the Passion. The prominent plant in the foreground to the viewer’s right appears to be the cinquefoil (Potentilla simplex), with its characteristic five pointed leaf. It was common in Europe and was often used in Medieval architectural decoration. This painting would seem to indicate that its five leaves symbolize the five wounds of Christ. Catherine like all her pious admirers has just offered herself to the Lord and now receives Him from Mary. Catherine herself holds the Infant with a white cloth. It’s as if she had just been handed the communion host by a priest. Joseph sits off to the right and strokes a black sheep or ram, itself recalling the Eucharistic symbolism of the scapegoat from Leviticus 16:20-22. Years ago famed art historian Erwin Panofsky noted that it is important to go beyond the naturalism and beauty of these famous and mysterious Renaissance paintings. In the years immediately following the onset of the Protestant Reformation, the Catholic Church responded with renewed devotion to the Eucharist. Artists and their patrons naturally followed suit. Titian, Bordone, and Lotto became increasingly responsive to the devotional needs of their patrons. * Anna Jameson, Sacred and Legendary Art, ed. By Estelle H. Hurrl, II, Boston and New York, 1895, v. II, 458. **Titian, Prince of Painters, 1991, cat. entry #23. *** Rona Goffen, Piety and Patronage in Renaissance Venice, Yale, 1986, 114. ****Titian’s Allegory of Prudence: a Postscript, in Erwin Panofsky, Meaning in the Visual Arts, Garden City, NY, 1955, p. 168.